Honestly, this is a new car. 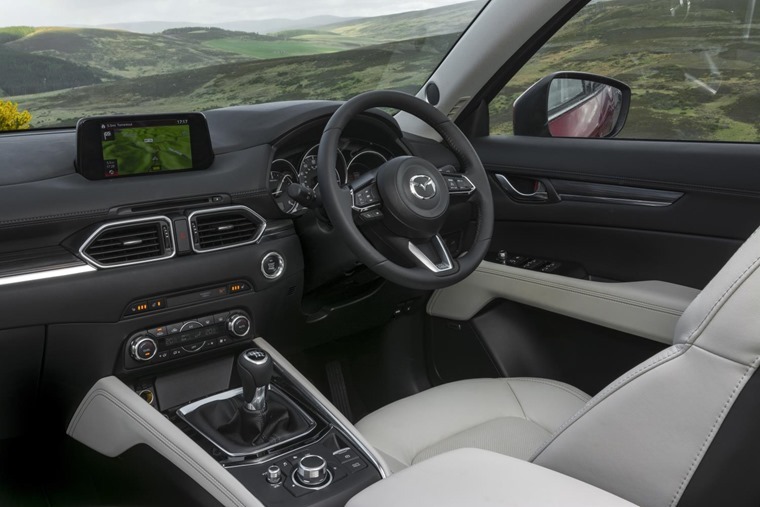 At first glance you might not be able to tell, but the more time you spend with Mazda’s Tiguan-rivalling crossover, the more detail you see. 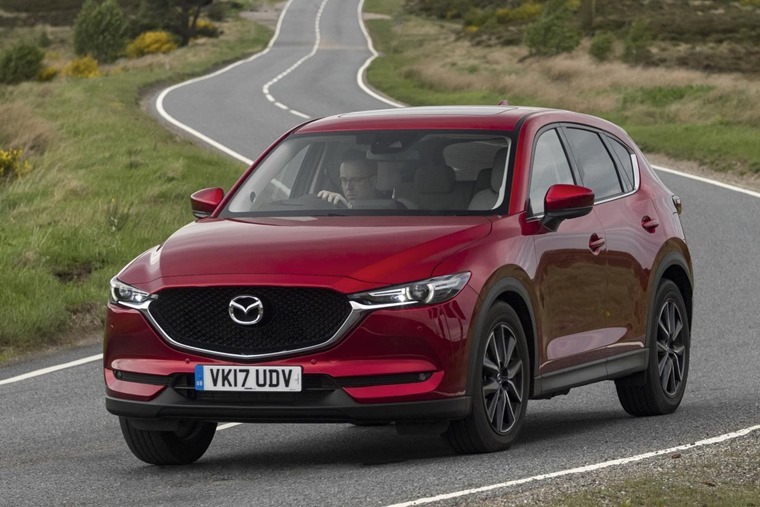 Or, rather, the less detail you see, thanks to Mazda’s ‘beauty through subtraction’ – a philosophy that’s seen the number of creases and folds around the car minimised to give the new CX-5 a sleeker appearance. It still very much exudes the Japanese aesthetic, the Kodo design language, but now it’s more cohesive and lends an air of solidity as well as grace. That solidity is helped by changes to the construction methods of the car resulting in a 15% increase in rigidity that helps the dynamics. The ride quality just gets better and better the faster you go. Combined with an increase in width and a lowering of height it’s altogether a more agile proposition than previously. It was never a bad car to drive but the new model moves things up a level or two. The heavy SUV-like body resists roll nicely and the car changes direction without protest, although the steering feels rather lifeless at times. It won’t worry Lotus but it’s as good as any other crossover. On the desperately wet roads at the launch the front end scrabbles around under power as the engine’s torque reserves are unleashed, but pleasingly the traction control doesn’t get involved unless the situation is looking like it’ll get out of hand – it’s better to have some wheel slip when pulling out across traffic than find the computer has cut all power in the name of traction. The penalty for a fine-handling and well-controlled model comes with a low-speed ride that’s only just acceptable. Poorly maintained urban roads thump and crash their way to the cabin, but the ride quality just gets better and better the faster you go. And with the fine-handling and eager engine that’s not difficult to manage. 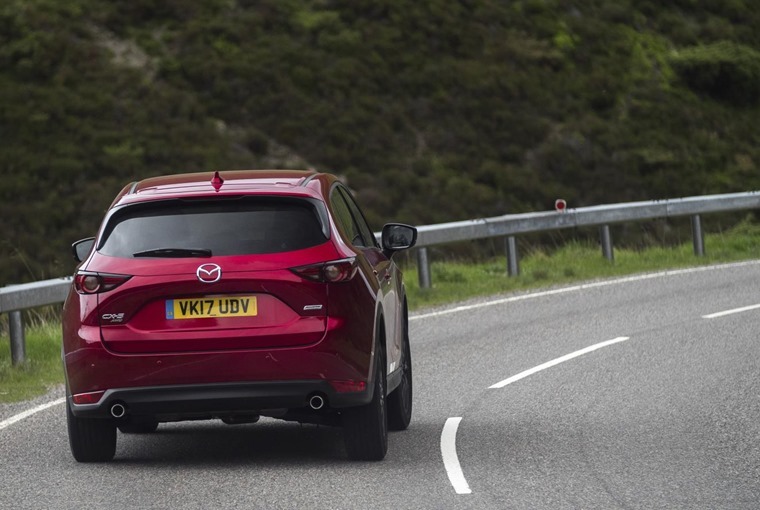 Mazda has spent some time improving the perception of quality in the car, with vibrations minimised. It’s a pleasant cabin to drive in too. There’s been a significant increase in perceived quality, while the design has caught up with the best in class as well. The infotainment screen now floats above the centre stack while the controls for heating and ventilation have been moved closer to hand. Material choice has improved as well with less brittle plastic and more premium feeling accoutrements. 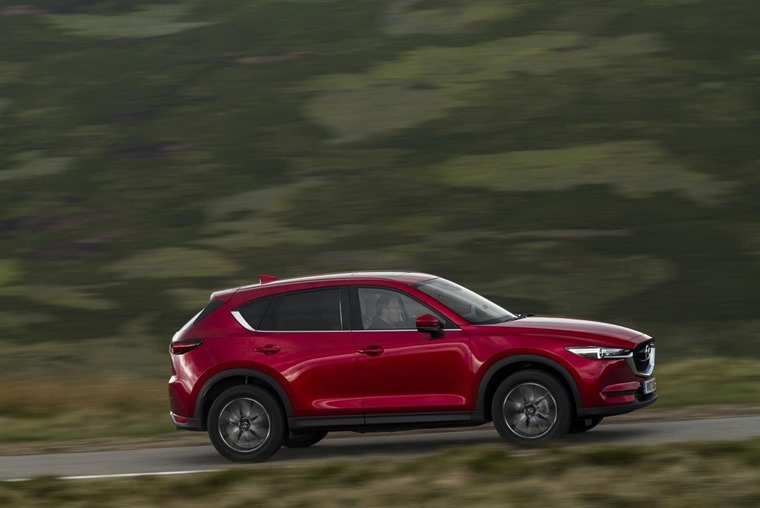 Mazda has spent some time improving the perception of quality in the car, with vibrations minimised as much as possible and noise levels kept in check by the addition of 50kg of new materials to absorb or stiffen the car. Sadly it’s not been entirely successful as the CX-5 still allows a fair amount of tyre roar through to the interior, especially on those wet roads. It’s better in the dry, but I suspect there might be more improvements to be made at the inevitable mid-life facelift. There’s more than enough space in the cabin though, with the increased size (if not height) of the CX-5 allowing a little more in the way of leg, knee and shoulder room. Comfortable leather-clad seats allow occupants to relax, with the rear seats now able to recline slightly for a more cosseting experience. One thing that’s not changed is the engine. The bulk of sales will continue to be for the 2.2-litre diesel, available in two power outputs. The 148bhp model will suffice for the majority as it’s easily capable of keeping up with traffic in all conditions, and even power through some opportunistic overtaking moves when necessary, but there’s a 173bhp option for those wanting a little more go. By choosing a large but unstrained engine, economy is surprisingly good with a promised combined mpg figure of 56.5. Emissions are pleasingly low too at just 132g/km. Is it good enough to be considered amongst the class leaders? It’s the Volkswagen Tiguan that Mazda is targeting, and it is using the age-old tactic of undercutting it on list price to get there. However, in regards to leasing this tactic doesn’t work** and due to residual values the CX-5 we tested ends up being a more costlier choice than a similar spec Tiguan (SE Nav 2.0 TDI). As good as the Mazda is, when it comes to leasing the Tiguan has it beat. That said, the 2017 Mazda CX-5 is great for those looking for a unique choice of crossover. **Volkswagen Tiguan average lease price is £259 using ContractHireAndLeasing.com data and based on typical 6+35 10k p/a deals. Correct at time of writing.